We were so excited when www.YouCanMakeThis.com asked us to host another giveaway. We really love that site! 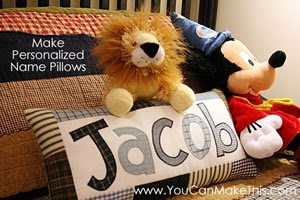 For this giveaway, www.YouCanMakeThis.com will give two...that's right two...winners the book on how to make Personalized Name Pillows. These pillows are so cute and easy to make. The book with all the instructions is really easy to follow too. People have loved making these for their children and it's written in a way that even a person who has never sewn before, could make these. 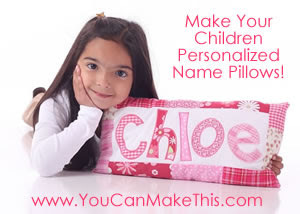 Just leave a comment on this post telling us who you would make the personalized name pillow for. That's it...easy! Of course you can earn extra entries. For each additional entry, leave a separate comment letting us know what you did to earn an extra entry. * Become a follower or a subscriber to our blog. * Post about this giveaway on your blog, linking back to this post. That is so cute! I would love to make one for my daughter! 1. I have yet to use the sewing machine I got as a wedding gift 5 years ago. 2. I want to see if this is really that easy to make because I'm really not that crafty. 4. I'm awesome! Really. I am. oh my gosh....love the pillows!!!!! and i can't sew worth a hoot......so sounds like maybe i could do this!?!?!??! i would make pillows for my kiddos first.....if that works out....watch out world i can sew!!!!!! and i am now a follower.....like your blog....very cute!!!! Love these, I would definitely make some for my daughters and for my niece! Cute cute! Added your button to my page! i want to do these!!! thanks. Those pillows are just adorable! I would definitely make one for my daughter, Kaylee. Of course I would have to make these for my two beautiful kiddos! These would make great gifts too though. Oh my goodness! This pillow is adorable! I would have one personalized for my daughter. OK, I decided to follow you, but I am not responsible if my blog reader explodes due to all the blogs I'm following! Ohhh these are lovely. I'd make them for grandkids: Nolan, Blake, Connor, Zoey, Brianna, and Brittany. Whew that is a lot of pillows! Oh my even a person that doesn't know how to sew can make one of these pillows! I am so in!!! Oh what a wonderful pillow! I would have one made for my son, William. I have an amazingly adorable granddaughter, Adeline, who would love her Marmie to make one of these for her. I have a machine, and now a purpose....I just need those instructions! That pillow has Sofia or Ella's name all over them! Precious. I would love to make a name pillow for both of my sons. They would LOVE it. I have a ton of nieces and nephews that I could make pillows for...hmmmm, maybe for myself? I would make this for my cute little on Alyce Jayne. I follow your blog for sure. My pillows would be for my daughter, Princess Amber. I would make one for my daughter.